The beautiful Long Hai Beach Resort. 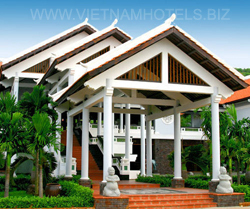 Located in the Ba Ria Vung Tau Province and just on the outskirts of the quaint little town of Long Hai we are nestled at the foot of the Minh Dam Mountains on one side and the South China Sea on the other. Our new Resort features all the amenities that you would expect from a world class property. From our giant, crystal clear pool that seems to disappear into the sea tand slots you are sure to find just the right activity to occupy your well deserved vacation time. You and your family may also want to enjoy our karaoke, massage, tennis courts, billiards, fishing, exercise room and much, much more. For your dining pleasure we provide international cuisine in our ocean view Heritage restaurant along with the fabulous Bamboo Buffet which also overlooks the sea. If you just can\'t escape your business but would still like a retreat? Well, we have that covered too. Our meeting facilities can handle just about any occasion. So visit us soon and we will open the door of one of our 110 lovely suites and villas to you. In fact...check out the "Promotion" link on our site and you'lll find a deal you can't say "no" to. The Long Hai Beach Club and Resort offering 110 luxurious rooms and suites create Vietnam’s most Unique Tropical Leisure Beach Club and Resort. Each room has a private balcony, air – conditioning, well – equipped with IDD Call, multi – channel satellite television, scheduled movies, safe box, mini bar, tea & coffee – making facilities suitable for group of friends and family. At whatever time of the day, our Resort ensure your stay with us an exciting and wonderful holiday. In our large swimming pool of 1200m2, you can relax yourself in the fresh water and revitalize your body in the LOTUS SPA with a wide range of traditional massage treatment. An adjoining TITAN FITNESS center features the latest equipment as well as steam bath, sauna, Jacuzzi for you to release stress and calm the mind. Outdoor floodlit tennis court, beach volleyball, billiards, plus entertainment slot lounge make our resort the most exciting in Vietnam. Your children will also be entertained at the Kid’s club with interesting games and toys. Great ocean – view & and swimming pool looking, a warm welcome is awaiting you in the DRAGON SWIMMING POOL & the DRAGON POOL BAR, where you can enjoy with food & beverage specialties, refreshing drinks and live music by famous band’s performance in the romantic atmosphere. At our KYLIN LOBBY LOUNGE, you also relax with various beers & solf drinks & wonderful music. Restaurants & Bars: KYLIN LOBBY LOUNGE, BRAGON SWIMMING POOL BAR, HERITAGE RESTAURANT & BAMBOO BUFFET.